The lives of the Monks John and Symeon, born in Edessa, are interesting examples of how a monk can understand his relationship with God and with the neighbors. The tradition situates the existence of the two saints at the ending of the 6th century. The “specific” of these saints is the fact that the love for God can reach the madness, and that is literally meant. There are a lot of “fools for Christ”. Even in the Desert of Egypt, at the end of the 4th century there is reported a saint nun called Isidora in a monastery near Tabenna, who “faked” madness in order to humble herself. The modern world knows better the popular Vassili Blazhennyi, the patron saint of the beautiful cathedral in the centre of Moscow. This saint was mocking the terrible Tsar Ivan IV of Russia without being harmed. 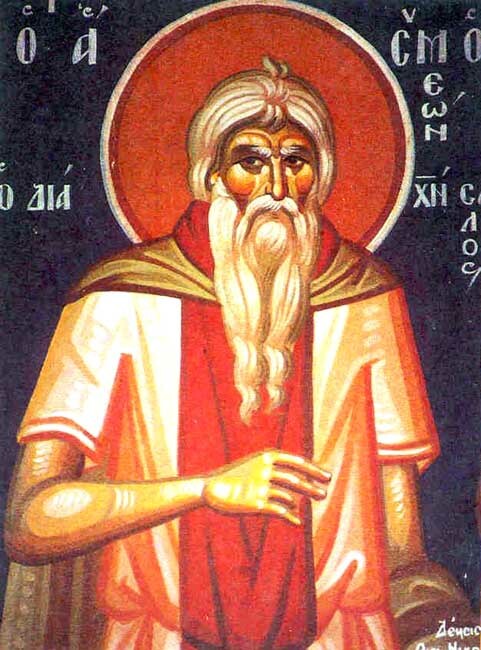 But the “classic” fool for Christ, the one who despised his human honor in order to save other Christians, is St. Symeon, usually associated with his friend, John the hermit. Although there are many „lives” of these saints, written shortly after their death, the most comprising biographical source is The life and behavior of Symeon the one called crazy for Christ, written by the very pious bishop Leontios of Neapolis in island of Cyprus. 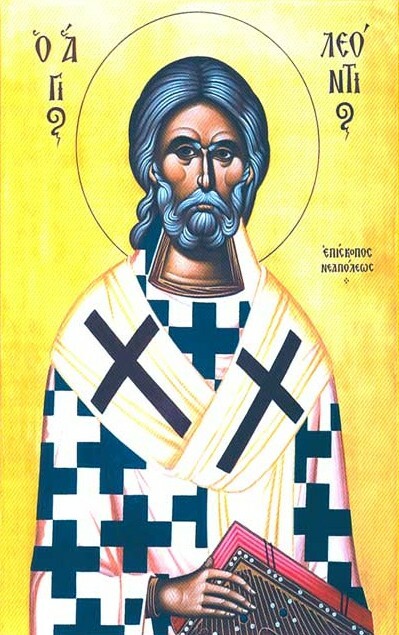 Leontios wrote about in 641 a Life of St. John the Merciful, Patriarch of Alexandria and the scholars believe that he has written the Life of Symeon later, but not after 649, when an Arab invasion occurred in Cyprus. The work of Leontios combines a classical biography of a monk with a collection of anecdotes, similar to the ones from the older story regarding the life of the Greek philosopher Diogenes, also known for his “foolish” or at least surprising sayings. Even from the beginning of the biography, Leontios try to explain to his readers how a life of a „fool for Christ” may be an exemplary life for a Christian, making an allusion of the Pauline understanding of the Christian mission (1 Corinthians 4,10). Only after this argumentation, he starts speaking about the young Symeon from Edessa (Syria), who went on pilgrimage to Jerusalem together with his friend John. Along the way, passing near the monastery of Saint Gerasimos, they decide to stay there for a while, listening to teachings of abba Nikon. Soon after, they decide to become monks, but after only one week, they leave the convent and start a life in the wilderness of the desert, with the consent of the abbot, who had a vision and understood their special situation. In the desert lands somewhere Jerusalem, „because of devilish temptations”, the two feel certain sadness to those left behind: Symeon had left home his old mother who was widow and had no other children, and John even more scandalous, left home in Edessa his young wife. Strangely the two pray God to take those women to Him. This happens after a while, and the two monks continue their solitary life for another 29 years. Here Leontios ends the first part of his story, which presents a classic biography of holy hermits. The second part of this story consists in 39 “anecdotes”. After a long period of working on their own “angelic life”, Symeon suggested one day to John that they should go together in the world, in order to save other souls, citing the example of 1 Corinthians 10,24, “each shall think not only about himself but also for the other”. But John, being afraid to return to the world, tries to persuade Symeon about the danger of living in the city. Finally, realizing that his friend is strengthened by God, he agrees with Symeon’s decision, though John remains further into the wilderness, feeling himself still not strong enough in his faith. Shortly after, Symeon went first to Jerusalem, where he remained for three days, then went to Emessa, an important city not far away from Antioch. In a so-called “Christian city”, he starts life acting as a crazy, entering the town carrying a corpse of a dog, tied to a rope he used as a belt for the ascetic clothing. Even the “innocent” kids, running after him, make a big fuss, beat him and call him salos, which means, “crazy”. The next day being a Sunday, Symeon goes to the church and starts provoking the pious Christians gathered at worship, throwing with nuts to them and quenching the candles. He is thrown away quickly and beaten again, this time by the adults. 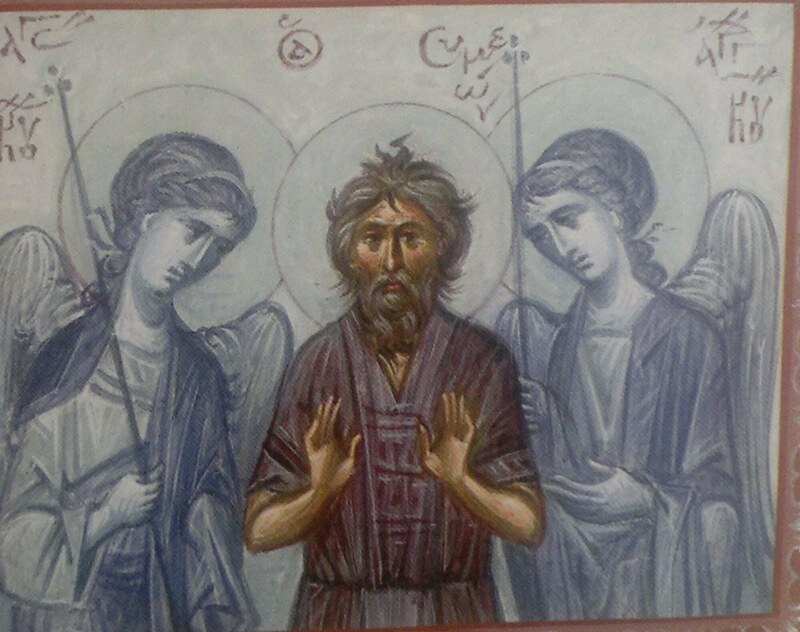 Symeon is saying to himself, that if he continues like that, he will be dead in a week. But he doesn’t stop. Further, a trader hires him to sell vegetables in the market. Symeon is acting strangely, eating beans and provoking a pestilential smell around. Instead of selling, he gives all the products to the poor and the passersby, he even spreads the money and for these things, of course, he is beaten again and chased. Other time he starts to undress himself on the road and enters naked in the public bath reserved to the women, defying decency. Meanwhile he does miracles or prophecies and casts away a devil from a young who committed adultery. He predicts an earthquake playing strangely: by beating with a stick some columns of the school-building, saying “you will fall”, and to others: “you will stay”. Moreover, he kisses the kids coming from the school: not all of them, but the ones who will die shortly because of the plague. Symeon makes secretly acts of charity and refuse any form of self-glory, making mute those who recognize the truth. In order not to scandalize his readers too much, the biographer is combining the foolish stories with the miracles and mentions the fact that the foolishness of Symeon was just a fake. In reality, the saint acted like that in order to shock the ones too conformist, and to show them that their piety is just a fake piety and the profound Christian sense is far away to be realized. Some other times, after a miracle or a healing, Symeon makes quickly something so stupid, so that the seers don’t realize the truth and look upon him further as to a lunatic and not as to a saint. Symeon is not only a wondermaker and a saint disguised in a harlequin, but also a fighter for the faith. Two monks from a monastery near Emessa, who wanted to settle a theological dispute, go into the wilderness to find John and Symeon. They reach John who guides them to the city, to Symeon, but he explains the orthodox position against the origenist one in a clever way, hitting and insulting one of them. Later he dances with the prostitutes, showing that he is passionless. He even gives money to some of them, trying to persuade them to abandon their practices. He often called the prostitutes his “girlfriends”, provoking the indignation to the townspeople. Under the guise of his insanity, he stops people on the street, slaps some of them, throws with stones to them, insults the religious precepts (e.g., the fasting times), all in order to save the souls of the neighbor, without being glorified by the others. After he miraculously saves the deacon John, who was almost killed because of some false accusations of murder, this deacon becomes his only confidant, the only one who knows the wisdom hidden under the mask of foolishness. Symeon later finds the money stolen by some thieves, heals some possessed, discovers the lies of some perjurers, and deprives a woman of her witchcraft power. In order to include in the stories also the others “unbelievers”, Leontios mentions also the Jew who was the glazier of the town. Symeon goes to him and starts to break his bottles by word. Finally, he tells to this Jew that all bottles made will break, until it decides to Christianize. That, of course, happens. The days of Symeon in the city of Emessa are’t too many. His way of living, on the streets, with the prostitutes and the homeless surely made him sick. Anyway, while living on the streets during the days, he spent the nights in his hut, which was rather a bundle of sticks, situated in the garbage zone of the town, praying incessantly with tears. In his last days he rarely speaks with the deacon John but finally he tells his whole life, just before he dies. Feeling his end near, Symeon remains hidden in his hut, where he dies in his sleep. The poor people (who were checking through the garbage) find him and remember about the “fool of the town”. They take and bury him in the cemetery for foreigners, without ceremony. But along the way, passing by the house of the converted Jew, this hears the voices of angels singing hymns of praise for Symeon’s funeral. 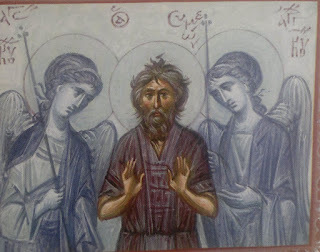 The deacon John knows very late about what happened and go to the cemetery, trying to make a decent funeral sermon for Symeon, but when his hired men dig for the body, they find the tomb empty: God have taken him. This is a topos presented in many lives of the saints “fools for Christ”, but not only. We may compare it with the story about the funeral of Our Lady Mother of Our Lord. At the end of the biography, Leontios concludes by stating that these mentioned were just some of the works of Symeon, who lived like an unknown. His life was told to him only by chance by John, the deacon from Emessa. Leontios urges his readers to take the example of Symeon and stop judging the neighbor, because the real deeds are known only by God. 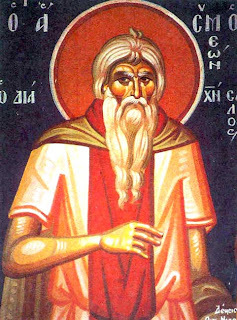 Saint Symeon is celebrated in the calendar of the Western Church on July 1, during the Eastern Church marked his feast on July 21 (August 3 according to the Old Calendar), the day of his death. He is jointly celebrated with John, his friend who remained in the wilderness of the desert. The way how Leontios explains the lifestyle of Symeon differ from the interpretations of this biography during the centuries. The later paraphrases, the short hagiographies, but especially the texts for the liturgical services have “soften” the language about the “madness” of Symeon. In an anonymous Byzantine Menologion from the 10th century, the compiler reduces the life of Symeon about to one sixth of the original, especially for practical reasons. There is renounced especially to some formulas of Leontios who appear to be too colloquial. The second part of the life of the saint is merely a listing of the wonders. The omissions of that paraphrase are instructive: explicitly scandalous episodes are not mentioned, such as Symeons defecation in public, or his tangle with prostitutes. Instead of this, the compiler simply says that Symeon has converted many prostitutes. The Armenian text renounces also to some of these episodes. The later compilers have a tendency to “theologize” and “moralize” the text. There is known that the liturgical texts were made for the daily service in the church, so their moralizing content was very important. A saint having a scandalous life could hardly be honored in the official calendar. The Synaxarion of Constantinople, also from the 10th century, covers the lives of Symeon”tou dia Hriston salou” and his friend John to only 47 lines, and that is how they appear in the modern menologies, such as the Romanian, in use today. Focusing on how the martyrs and saints died, the author states only that Symeon pretended to be crazy, and mentions that the truth about his life came miraculously to light only after his death. It is difficult to say that the Byzantine liturgists would be truncated only the life of Symeon. Rather we might say that the text has been reduced so much for practical reasons and only secondly for moral purposes. But whatever it may be, these later texts miss the lack of shame of Symeon and the shock capability of the story. The author of the later life of Andrew Salos, the most popular Greek “fool for Christ”, who lived in 10th century in Constantinople, borrows many elements from the biography written by Leontios. Later, the Russian biographers of the new saints “fools for Christ” (called here jurodivyi, that meaning “aborted fetus”) make use of the biography of St. Symeon too. Saint Vladimir (in Ukrainian -Volodymyr, Old Norse - Valdamarr), called often also as Svyatoslavich, after his father, is traditionally known as „the Baptizer of Kyivan- Rus”. As Grand Prince of Kyiv (958-1015) he introduced the Orthodoxy in his land. Vladimir was born around 958, near Pskov, being the son of Prince Svyatoslav, the grandson of St. Olga, and the father of Sts. Boris and Gleb „the Passion-Bearers”. His name, of Slavic origin, is composed from the elements wlodi - „rule” and mir – „peace”. 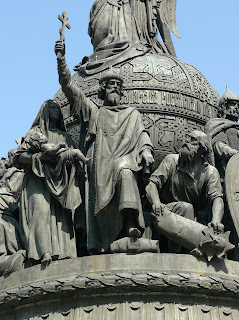 After the Slavic tradition, transferring his capital to Pereyaslav in 969, Svyatoslav designated Vladimir as ruler of Novgorod, Yaropolk in Kyiv and Oleg as the ruler over the Drevlians („people of the trees”, that means, of the woods western of Kyiv).But after Svyatoslav's death (972), it has started in 976 a fratricidal war between Yaropolk and Oleg, who was killed shortly after. In order not to be also killed, in 977 Vladimir was forced to flee to his relative Ladejarl Håkon Sigurdsson, the ruler of Norway. Here he assembled a Varangian army and reconquered Novgorod. Shortly after, Yaropolk was killed by two Varangians and Vladimir became the knjaz of both Novgorod and Kyiv. Over the next 35 years Vladimir expanded the borders of Kyivan-Rus and turned it into a powerful state in Eastern Europe. Even if he was educated as a child by his grandmother Olga, it seems that he was still a devout pagan in his early life and erected many statues of the old Slavic gods in the lands that he ruled over. He had five wives, being father of eleven princes, the most known being Svyatopolk I, Yaroslav the Wise, Mstyslav and Saints Borys and Gleb. At the time being knjaz, he received at his court numerous religious messengers, proposing him to adopt their faith. According to the Primary Chronicle, in 987, after a consultation with his boyars, Vladimir decided to send envoys in order to research the religious life of the neighboring. In the Chronicle of Nestor there is an interesting reference about this fact. Meeting the Muslims, the envoys felt that there was no joy among them, and especially their taboo against alcoholic beverages and pork determined Vladimir to say that drinking is the joy of all Russians and they cannot exist without that. The envoys also met with Jews and Catholics, but were still unimpressed. Going in Constantinople and attending the Divine Liturgy in the Cathedral of Hagia Sophia, the envoys of Vladimir said that they didn’t know any longer whether they were in heaven or on earth. 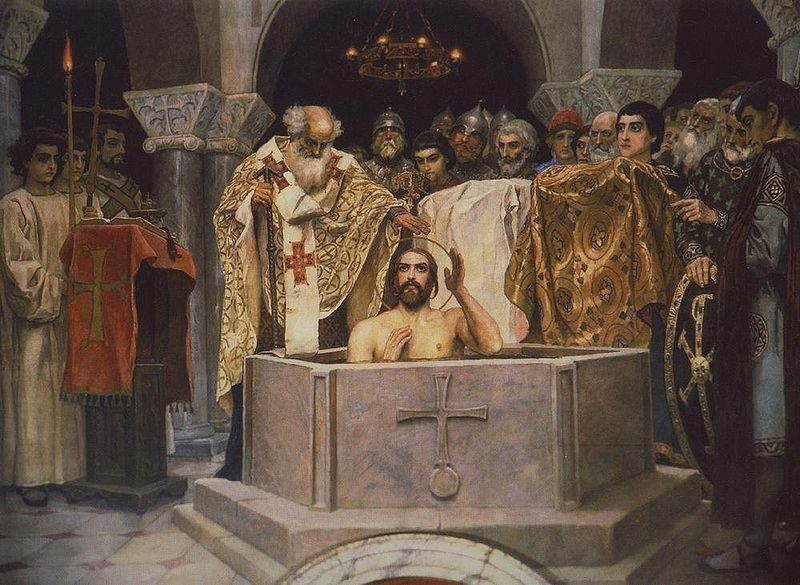 So, in December 987, Prince Vladimir was baptized on the shores of the Black Sea, probably in Kherson, receiving the name of Vasily (Basil), after the emperor Basil II of Constantinople also known as the “Bulgarian Slayer”. Shortly after, he took as wife Anna, the emperor’s daughter, and they went back to Kyiv. Together with him came some Greek priests who baptized the inhabitants of the capital, on August 1, 988. This day is officially known as the date of the Christianization of the Russians. The population of Rus was anyway slowly converted, and sometimes by force, during the centuries. Anyway, some Arab sources (Yahya of Antioch, al-Rudhrawari, al-Makin, Al-Dimashqi, and ibn al-Athir) present a different story of Vladimir's conversion. Emperor Basil II of Constantinople found himself in difficulty 987, after a revolt of Bardas Skleros and Bardas Phokas. Basil asked for the help of the Kyivan Rus, until then an enemy, and Vladimir agreed, in exchange for a marital tie. He also accepted to become a Christian and to convert his people to the new faith. After the baptism, 988 Vladimir sent 6000 of warriors and besieged the strategic city of Chersones Taurica in 989, taking it from Bardas Phocas, and giving it back to Basil. The conversion of Vladimir was an act of politics, but even so, there was not a superficial change of faith. Vladimir changed his life and destroyed the pagan statues in Kyivan Rus, replacing them with churches. He also attempted to live in peace as much as possible with his neighbors and had since then only one wife. He also took a serious care for the poor, that being unusual at that time among his people, and tried to spread the Christianity beyond his borders. The Primary Chronicle says that “He ordered the all poor and sick to come at his palace for food, drink and money. And for the ones unable to come, he filled some carriages with bread, flesh, fish and honey and sent them in the city”. In his capital Kyiv, he built the Church of the Tithes in the honor of the Dormition of Our Lady (989) and helped to the construction of some monasteries on Mt. Athos. After Anna's death in 1011, Vladimir married a German princess, the daughter of Count Kuno von Enningen. In the last year of his life, his sons Svyatopolk established in Turov and Yaroslav the Wise who ruled in Novgorod challenged his rule. After defeating Svyatopolk, Vladimir fell ill, most likely of old age and died at Berestovo, near Kyiv on July 15, 1015 and he was buried in the Church of the Tithes. He was succeeded by Svyatopolk. The Rus clergy venerated Vladimir because of his support of the church, but he was canonized much later. The oldest extant mention of him as Saint Vladimir is found in the Hypatian Chronicle under the year 1254, and his feast day July 15, (July 28, according to the Old Calendar) was first celebrated in 1263. In 1635 there is a mention, according to which it appeared that his body has not decomposed. The various parts of his dismembered body were distributed among his numerous sacred foundations and were venerated as relics. In the Russian Orthodox Church, St. Vladimir is referred to, like his grandmother Olga as a holy “equal to the Apostles” and grand prince of Kyiv. His cult is widespread in Russia, Ukraine and other Slavic countries, being considered the patron saint of the blind and diseased eyes. In the iconography of the saint is depicted in red royal robes, interspersed with gold designs, with a crown on his head. In his right hand he is holding a cross (on some icons assuming the relatively large size), and in the left he bears a sword. Sometimes it is presented with the scroll in his hand, containing a prayer for the newly baptized people. Holy Prince Vladimir, you were like a merchant in search of fine pearls. By sending servants to Constantinople for the Orthodox Faith, you found Christ, the priceless pearl. He appointed you to be another Paul, washing away in baptism your physical and spiritual blindness. We celebrate your memory, asking you to pray for all Orthodox Christians and for us, your spiritual children! Saint Olga, Grand Duchess (knjagina) of Kyivan-Rus, is one of the most popular local saints in the Eastern Europe, usually called as “equal to the Apostles” because of her mission of Christianization realized during her times. Olga was born about 890. According to the Russian Primary Chronicles, she came from Pskov, but the church sources names a village in Wybutska near Pskov as her origin. Probably she was of Varangian origin (Nordic population from the same family of languages with the Vikings), established in the northern regions of the actual Russia. By some accounts, she was the daughter of Oleg of Novgorod. Her name is Olga has probably Scandinavian origins, deriving from Helga, an Old Norse word from the root heill, meaning “enjoying prosperity”, or “being happy”. According to some other hypotheses, Olga was born in Pliska, Bulgaria, her father being the knjaz Vladimir of Bulgaria. This hypothesis goes from the fact that her first grandson was named Vladimir, after her father, respectively one of his sons Boris, after her grand-grandfather, Boris, the Christianizer of the Bulgarians. Anyway no other source attests these suppositions. At the age of about 20, that is, around 903 B.C., she married Prince Igor I, the son of Rurik, the traditional founder of Russia. Prince Igor succeeded his father as the ruler of Kyiv about 912. In this time, Olga gave him a son called Svyatoslav, the father of St. Vladimir. Igor was murdered while collecting tribute from the Drevlians in 945. At that time, their son Svyatoslav, was only three years old, and Olga became the official ruler of Kyivan-Rus until her son reached adulthood, that is about 945–c. 963. As a widow, she used to have many problems with the neighbor Drevlians, a nation living in the woods from the region situated at the West of Kyiv. Their name, meaning “people of the trees”, suggest their way of living. Olga is remembered in the Primary Chronicles for her revenge against these people who murdered her husband. 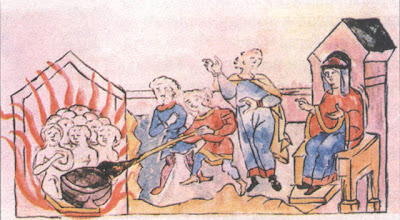 Shortly after killing Igor, the Drevlians sent twenty of their best men to convince Olga to marry their prince Mal and give up her rule of Kyivan Rus. After tricking them, she ordered her servants to bury them alive. Then she sent a letter to prince Mal, that she accepts the proposal, but she requires other envoys, namely their most distinguished men, as for her noble position. The prince sent his best men who helped him governing the land, but Olga prepared for them a bathhouse, burning them alive inside it. After that, she planned to destroy the remaining Drevlians, by inviting them to a funeral feast at her husband's grave. After the Drevlians became drunk, Olga's soldiers killed over 5000 of them. The ones still alive begged for mercy and offered to pay for their freedom, but she asked only for three pigeons and three sparrows from each house, since she did not want to burden the villagers any further after the loss they suffered. Then Olga gave to her soldiers the pigeons and the sparrows, ordering them to attach by the feet of the birds pieces small pieces of cloth soaked in sulphur and to release them. The birds flew to their nests and set on fire all the houses. The people fled were captured or killed, while some others she gave as slaves to her followers. The remnant left paid her tribute. Olga remained regent ruler of Kyivan-Rus with the support of the army and her people. She changed the system of gathering tribute (poliudie) in the first legal reform recorded in Eastern Europe. 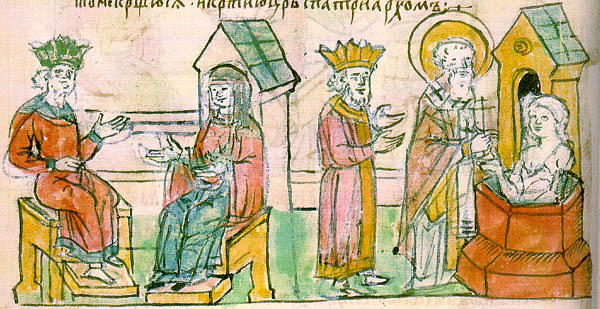 In the following she continued to refuse different proposals of marriage, and managed to save the power of the throne for her son Svyatoslav, major in 963 or 964. There is uncertain when Olga became interested in Christianity, but it is possible that her interest may have started before her visit to Constantinople, happened, after different sources, sometime between 954 and 957. The ceremonies of her formal reception in the capital of the Byzantine Empire are described by the emperor Constantine VII in his book De Ceremoniis. The Slavonic chronicles add apocryphal details to the account of her baptism, such as the story how she charmed and "outwitted" the widower Constantine, who proposed her to marry. Olga agreed to be baptized first, because only as Christian she could marry a Christian emperor. After that, she asked the emperor to be her godfather. After the Patriarch Polyeuct had instructed her in the faith, she was baptized with the name Helena, but not after St. Helena the Empress, as believed. The wife of Constantine, in reality dead only in 961, was named Helena Lekapena, being probably her godmother. But traditionally, after the baptism, Constantine requested once more her hand. Instead, Olga tricked him saying that she is his daughter in baptism and such a union is forbidden under Christian law. Even if Constantine commented to Olga about her trickery, he offered her many gifts and let her to return to Kyiv. In truth, this marriage affair is quite impossible to be real, because at the time of her baptism, Olga was an old woman, while Constantine had a wife, being widower only a few years later. Back in Kyiv, Olga instructed her son Svyatoslav and entreated him to be baptized. However, she failed to convert him, because he was more interested into the domestic fights and tribal wars, but this situation left into her care Vladimir, the presumable successor to the throne who later adopted Christianity as a state religion. Anyway, while Svyatoslav was not brought to baptism, he would not forbid others. In the latest years of her life, Olga constructed two churches, namely the wooden church of St. Sophia (Wisdom of God) in Kyiv and the Holy Trinity church in Pskov. In 968, while Svyatoslav was in a campaign of war against the Bulgarians, the Pechenegs surrounded Kyiv in a siege. At the moment, Olga was living into the city taking care for her grandsons Yaropolk, Oleg, and Vladimir. As the people became weaker with hunger and lack of water, Olga inspired a lad to escape the siege and bring relief. Svyatoslav came back in hurry and found his mother very sick. His intentions were to move his residence to Pereyaslav (which is on the Danube River), leaving Olga in Kyiv, but she restrained Svyatoslav from leaving until after she had died. Saint Olga died on July 11, 969 and she was buried by a priest, having ordered that there would not be a funeral feast after the heathen Slavic customs. Presbyter Gregory, who was with her at Constantinople in 957, fulfilled her request. The Russian Synaxarion calculates that she was 20 years old at her marriage, and the next 42 years she was the wife of Igor. Then she reigned 10 years before her Baptism and after that she lived 15 years more. So she died about 90 years old. While Olga was not successful in converting her son or many others to the Christian faith, her example may have been a great influence on her grandson, Vladimir, who in 988 became an Orthodox Christian and led the inhabitants of Kyiv and Rus to follow him in Baptism. 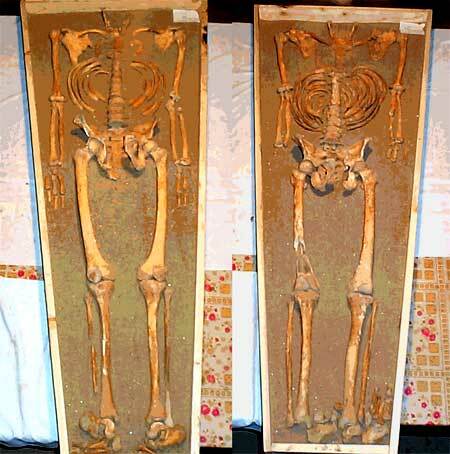 During his reign, prince (knjaz) Vladimir was discovered that the body of Olga has not decomposed, traditionally in 1007. This was the first case in relieving relics in the Slavic Christianity. Her body was placed in a coffin inside the Church of St. Sophia (Wisdom of God) in Kyiv. Anyway, only in 1574, the Russian Orthodox Church officially canonized Olga as a saint. Even if her grand-grandsons Boris and Gleb are the first officially recognized saints in Russia, Olga remains the first saint of her people, celebrated on July 11, that being according to the Old Calendar, July24. During the Tartar invasions in the next centuries, the sacred relics of Olga became a source of numerous miraculous healings. At the beginning of the 18th century, the coffin was hidden in an undisclosed location and has not yet been found. In 1939, an expedition lead by the Leningrad scientist Mikhail Karger discovered some hidden recesses in the foundations of the Tithe Church in Kyiv. Within these recesses lay the remains of people, including a female skeleton with golden ornaments, so that the archaeologists inclined to believe that these were the relics of St. Olga. Anyway that was not officially confirmed until today. 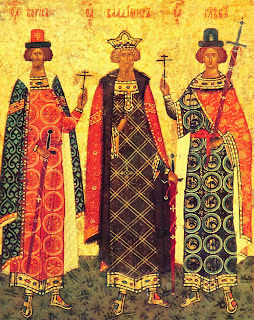 Because of her proselytizing influence, the Orthodox Church calls St. Olga like her grandson Vladimir by the honorific title of eissapóstolos, "Equal to the Apostles", such as St. Helena and Emperor Constantine in the Byzantine Empire. Through this title there is recognized the importance of her role to the Christianization of the Russians, process which happened only during a few centuries. The cult of St. Olga is widespread, although especially vivid in the Russian Orthodox Church. The icons present St. Olga as a mature woman, dressed in red and golden robes and bearing a princely crown. From the crown to the shoulders it drops a white scarf. Popularly she bears a cross in his right hand, but in other depictions she may not have a cross, instead her hands are prayerfully made on the chest. Giving your mind the wings of divine understanding, you soared above visible creation seeking God the Creator of all. When you had found Him, you received rebirth through baptism. As one who enjoys the Tree of Life, You remain eternally incorrupt, ever-glorious Olga! 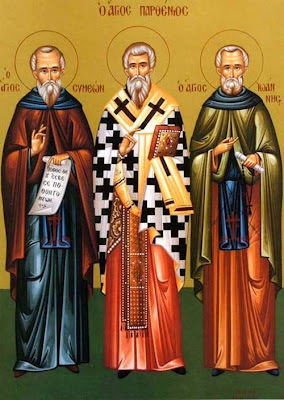 Saint Epictetus, priest, and Saint Astion, (improperly said) monk, originals from Asia Minor, were martyrs for Christ in the 3rd century in Scytia Minor (the today Romanian region Dobruja, situated between Danube and the Black Sea). They were originary from Little Asia. Information about their lives is known only from a copy of a 15th century manuscript kept in the archive of the Savior Church in Utrecht, published in 1615 by the Jesuit monk Herbert Rosweyde, the initiator of the hagiographic collections Acta Sanctorum, under the title “SS. Epicteto presbytero et Astion monacho, martirybus Almiridiensibus in Scythia “. After passing the 30 days of starvation, the two saints were brought back to court, where they confessed Christ once more, saying that their miracles were no witchcraft, but power given by their Lord. "Hearing this, that crazy with a beast soul ordered his servants to crush with stones the faces of martyrs. He asked also to bring some ash rods and to hit them until giving their souls […] but because as many blows they endured, they received them always happy and fully hearted in confessing their Lord, then the servant of the devil, seeing that his madness cannot in any way overcome their constancy, he commanded the servants to take them out of the city and to cut their heads with the sword”. Together with the remains of two martyrs, there were found some fragmentary inscriptions on the chamber’s eastern wall. On the first two rows from the whole seven it have been decoded the Greek words “Martyrs of Christ”, and on the fifth, the word “Asto” finished with the Greek letter “v”, which Latin correspondent is “n”. In the seventh raw there were identified the first three letters of the verb “ibrio”, meaning “to molest, hit”. These indices led the archaeologist Michael Zahariade to believe that he found the relics of Epictetus and Astion, whose lives and sufferings are recounted in "Acta sanctorum". The anthropological expertise have shown even the health situation of the two saints, and offered information about the last 35 days of their lives. St. Epictetus and Astion are not the only martyrs in Dobruja during the reign of the last persecutors. Together with them, there are known also St. Emilianus, soldier in Durostorum, who died in the time of Julian (361-363) and celebrated on 18th July, and the Martyrs from Niculiţel, Sts. Zottikos, Attalos, Kamassis and Philippos, mentioned in a Syrian Martyrology on 4th June, whose relics were discovered in 1971. 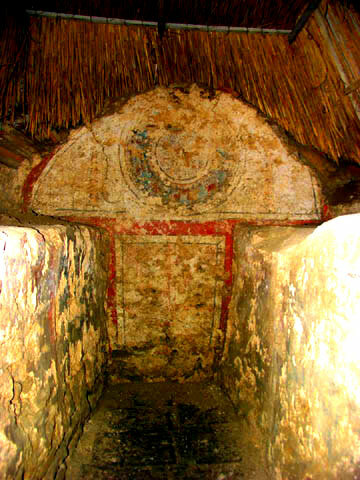 A crypt with relics of saints was found also in Adamclisi, but the identity of the martyrs is still unknown. 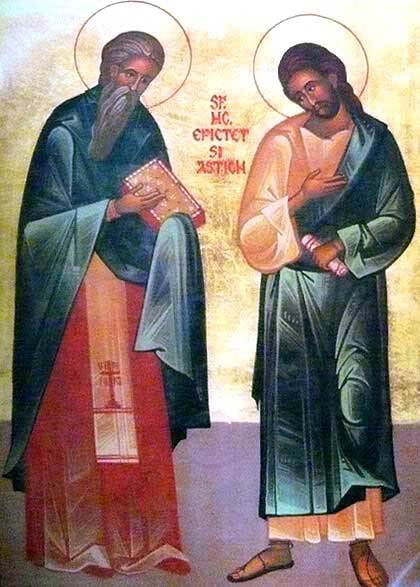 Oh, faithful believers, come to praise Epictetus, the wise teacher and Astion, the very zealous disciple with the the same praise as Hermolaes and Panteleimon , as the martyrs of Christ and the praise of Dobruja, saying to them: enjoy, you who always intercedes for our souls!